President Barack Obama and new FBI Director James Comey sat on stage Monday in front of a brass frieze of J. Edgar Hoover, the former FBI chief, who kept dossiers on elected leaders, civil rights activists, Hollywood stars and other important figures of his day. The occasion was Comey’s installation as the seventh director, a ceremony held in the open-air courtyard of the bureau’s brutalist 1970’s-era headquarters. Hanging in the air were the latest round of revelations from former National Security Agency contractor Edward Snowden, whose disclosures of secret government eavesdropping programs have given rise to intense scrutiny of alleged government abuse of power to rival Hoover’s day. Among those who Hoover spied on was civil rights leader Martin Luther King Jr., who Hoover suspected of having Communist leanings. “Our first half-century or so was a time of great progress and achievement for this country, and for the bureau. But it also saw abuse and overreach - most famously with respect to Martin Luther King and others, who were viewed as internal security threats,” Comey said. Comey’s predecessor Robert Mueller extended the practice, and Comey plans to continue it. But Comey also plans to add a new destination for future new agents – the FBI’s Quantico training facility is without a new class of agents in part because of budget cuts under sequestration. 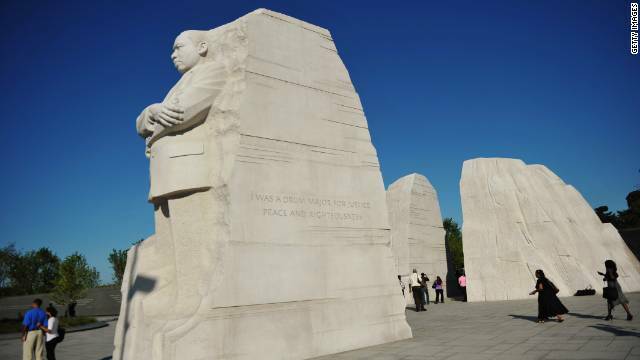 He plans to mandate that new agents and analysts also visit the Martin Luther King Memorial, a short distance away from the Holocaust Museum. “I think it will serve as a different kind of lesson –one more personal to the Bureau, of the dangers in becoming untethered to oversight and accountability,” he said. This memorial is so nice I was there a few years back when it first opened great job guys . It hasn't quite come to that point yet...but it's coming. Perhaps NSA agents should also be required to visit the memorial. I applaud the move. The press conveniently overlooks (or provides implied consent) for the FBI's requirement that its new agent trainees visit the Holocaust Museum to learn of the horrors that the Nazis and their collaborators, not the US, committed in Europe, not in the USA. The MLK memorial evokes thought on the fight for civil rights, dignity and equality for ALL Americans, rights that were denied by the US in the USA. Prospective law enforcement officers need to know our history "or be condemned to repeat it". TOUCHE'! MR. FRANK MONDANA! TOUCHE'!it's refreshing to FINALLY read a logical & intelligent comment.it just amazes me that those who r racists, always hide behind a keyboard now instead of a sheet.which shows how much integrity they lack..i applaud the director for trying to open the minds of those that think this would be a waste of time.they're the ones who could learn from it.it's a strong essence to have compassion & empathy for ur fellow man.especially serving the fellow man. And again where is the ACLU to stand up for these employees that are being forced to go to a memorial that they may not have any desire to go to? They comment on Hoover thinking mlk had communist leanings then turn around and do something that would be considered socialist. 1- Are you a cadet? Then it doesn't affect you or that bigoted brain of yours. I'll bet if they were told they have to go to the Memorial for a dead white guy you'd be all over it. 2-They are federal employees and are in an agency that had a few issues under Hoover. He is making a point with this visit. So relax, nobody is forcing you do something nasty it's only for FBI training. Wait, let me guess, you're not a bigot because you have some black friends right? What is remotely "socialist" about going to the MLK Memorial? Or are you using the Republican definition of "socialist", which means "anything I don't like"? Hoover could only collect facts. Why were they sealed for 50 years?? May be the Truth hurts. Or maybe the "facts" he collected were from "certain sources" and "they" told him some things. I'm sure he never altered this evidence so they would back up his personal conclusions. Guess what? There are many records from many agencies that are kept secret for 50 years. Hoover's data was not handled any differently. Man, there are so many folks who comment and give opinions that make it obvious they haven't read anything longer than what can be perused during the average crap. It might also help some of these folks to read something other than the fairy tales of an old book and the writings of televangelists. Totally out of bounds on MLK records. ANYTIME a federal enactment is given consideration ALL facts should be thourghly examined by ALL our elected Officals. NOTHING should be hidden from scrutiny. This is not the case here. I would suggest people might pull their heads out of their "intelectual" sands. These records, sealed by a Federa Judge in 1977, left no chance for a congressional inquiry into the facts and possible hear-say involving a Federal holiday. To say the least, this is not the Democratic process that our Founding Fathers indorsed.